President Donald Trump responds to questions from the media in the lobby of Trump Tower in New York on Tuesday. 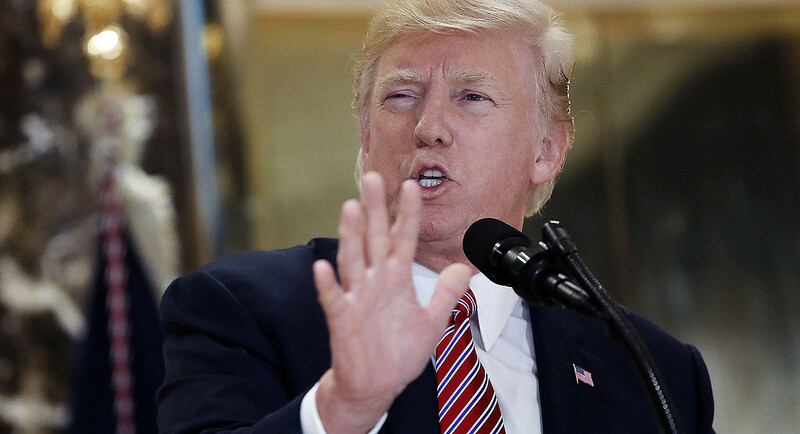 It took President Donald Trump two days to explicitly call out the white supremacists and neo-Nazis who engaged in violent protests over the weekend that resulted in the death of a 32-year-old Charlottesville woman. It took him less than 24 hours to undo the damage control that had been foisted upon him by teleprompter-wielding, crisis-managing aides. Bridling at the term “alt-right,” Trump attempted to redirect blame for the violence at the rally onto the other side. “What about the alt-left that came charging at the, as you say, the alt right? Do they have any semblance of guilt?” he said at an unplanned news conference in the lobby of Trump Tower, referring to the “alt-right” protesters who gathered to protest the removal of a Robert E. Lee statue from a park. Trump also said he has yet to speak to the family of the woman killed, Heather Heyer, but promised that he would be “reaching out” and applauded her mother’s “beautiful statement,” in which she praised Trump. With no teleprompter to keep him on a message crafted for him by his top aides, like chief of staff John Kelly, Trump reverted to the “many sides” language he ad-libbed on Saturday — remarks that earned him criticism from Republicans and Democrats alike, and even pushback from his own top aides. The free-wheeling remarks represented an about-face for the president, who after two days relented to pressure from his administration to read the statement that included the words “racism is evil,” while calling out specific types of hate groups, including the Ku Klux Klan and neo-Nazis. In his only appearance in front of the press on Tuesday, Trump was originally scheduled to make a short announcement on infrastructure from the lobby of his Manhattan home. He came equipped with charts to show how his administration was cutting the regulatory red tape to make building roads less onerous. Reporters were warned he would take no questions, and that two of his top aides, economic adviser Gary Cohn and Transportation Secretary Elaine Chao, would take questions after the president departed. But Trump overruled his staff. Kelly stood off to the side while Trump spoke, staring down at the marble floor as the president doubled down on his widely criticized “many sides” rhetoric. Kelly’s stiff body language appeared to reflect the feeling among many Trump aides. “My head is spinning,” texted one White House aide watching the president unleash himself on television. When asked whether he and other officials supported the president’s views on the protest, Cohn hedged. “We share the president’s view that infrastructure is really important to America, and our infrastructure is crumbling,” he said. Jared Kushner and Ivanka Trump, the two family members who serve in Trump’s administration, were absent from Trump Tower on Tuesday -- they were on a two-day, pre-scheduled trip to Vermont, a White House official said, and were planning to rejoin the president at his Bedminster, N.J. golf club on Thursday. Trump’s charged statements on Tuesday inflamed the controversy his aides had just started to contain. After Trump's original ad-libbed comments on Saturday, his communications staff went into immediate crisis control, according to a White House official. An anonymous press statement was released, stating that the president "condemns all forms of violence, bigotry and hatred. Of course that includes white supremacists, KKK, neo-Nazi and all extremist groups." The statement was put out with no name on it because press secretary Sarah Huckabee Sanders was on a brief vacation in Bermuda, the official said. The statement was written by another more junior press aide, Jessica Ditto, and the hope was that it would gird against the backlash to the president's own words.